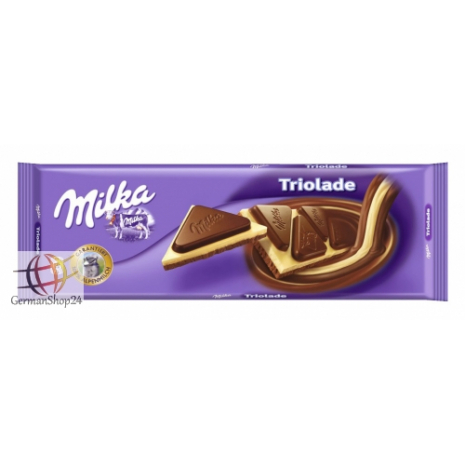 Milka Triolade is a combination of three delicious types of chocolate and provides chocolate delight to every kind of chocolate lover out there. Smooth melting Alpine milk chocolate, creamy and delicious white chocolate and bitter sweet chocolate seal the deal. 270g / 9.52 oz NET. WT. Sugar, cocoa butter, cocoa mass, SKIMMED MILK POWDER, SWEET WHEY POWDER (from MILK), BUTTERFAT, emulsifier (SOY LECITHINS), HAZELNUTS, flavoring. Cocoa solids: at least 30% in the milk chocolate. Cocoa solids: at least 45% in the dark milk chocolate. Zucker, Kakaobutter, Kakaomasse, MAGERMILCHPULVER, SÜSSMOLKENPULVER (aus MILCH), BUTTERREINFETT, Emulgator (SOJALECITHIN), HASELNÜSSE, Aroma. Kakao: 30% mindestens in der Alpenmilch-Schokolade. Kakao: 45% mindestens in der dunklen Alpenmilch-Schokolade.